When I first saw Ghostbusters back in 1984, I thought that the Stay Puft Marshmallow Man was an actual mascot--considering that not all food brands are sold or marketed in all parts of the country. Turns out that Dan Aykroyd dreamed up the Stay Puft Marshmallow Man for the movie, so actual Stay Puft marshmallows had to remain, for my teenagehood, just a puft dream. Until now, that is. 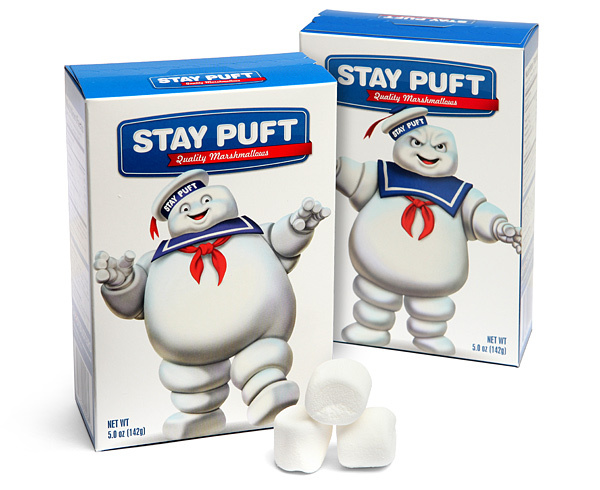 Today, I'm happy to report that you can now buy Stay Puft marshmallows featuring that Michelin Man-like creation of corn syrup and gelatin that terrorized the ghostbuster guys, the Marshmallow Man himself. Each box features the jolly side of the Marshmallow Man's personality as well as the agitated one that wanted to stomp on New York City. ThinkGeek.com is selling the marshmallows as an official Ghostbusters collectible, but who in their right mind could actually resist eating them? At $7.99 per box they're a little pricey for junk food, but seem like they'd make a great novelty gift for fans of the movie.